Spread 1 teaspoon mayonnaise spread on each bread slice. 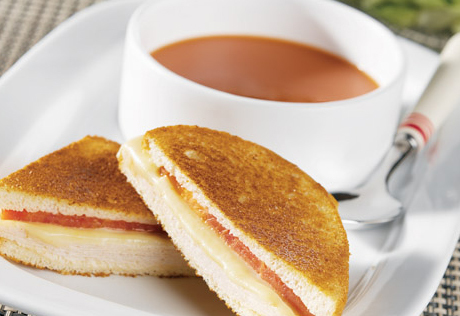 Top each of 6 bread slices with 4 slices turkey, 2 slices cheese and 1 slice tomato. Top with the remaining bread slices, mayonnaise spread-side down. Spray a 10-inch skillet with the cooking spray and heat over medium heat for 1 minute. Add the sandwiches in batches and cook until they're lightly browned on both sides and the cheese is melted. Serving Suggestion: Serve with Campbell's® Tomato soup and a tossed salad with your favorite dressing.